EVERYONE IS FREE to eat delicious food however they please, we all know this. It’s not a Snickers. Kit Kats are designed to break apart for your convenience. Throwing it all in there in one go is a tyranny on chocolate. What fresh hell is this? The triangle cutting technique is proven over time – it makes the slices easier to pick up and gives everyone an equal share. Sure, personal choice and all that. But you’re ruining the texture of the chips as well as denying a nibble to anyone else. That might be part of your plan though, you geniuses. This might actually help with flavour, but the aesthetic appeal of the crisps has been lost forever. The orange segements are perfectly designed to pick off. What are you DOING? Exceptions can, of course, be made for those monstrously big burgers. But other than that, the two buns of the burger are the perfect burger handles. Please, use them. Real life people are out there right now doing this. 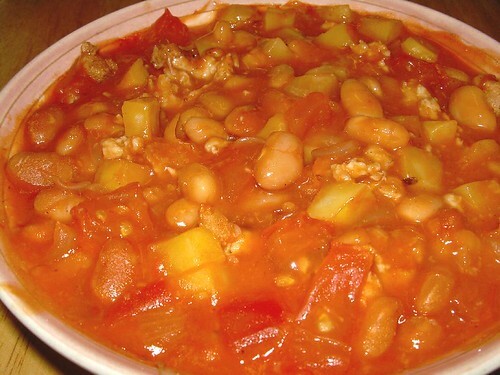 Potatoes, meat, vegetables and beans – all mixed together to create a sort of orange sludge. Leaving one soggy, depressing sliver of a middle. Two completely different tomato-flavoured sauces – in one pizza. How is this travesty allowed? The final insult. Do you or any of your friends indulge in such crimes? Do you feel the need to stick up for these practices? Let us know in the comments. Email “10 eating habits that need to be stopped”. Feedback on “10 eating habits that need to be stopped”.